They say that mad dogs and Englishman go out in the midday sun, but there doesn’t seem to an equivalent saying for Cape Randonneurs gathering for a 1,000km Audax at 9pm on a cold mid-winters night – beyond just simply “mad” that is. Five of us started out from Vrede to embark on this epic adventure, although we weren’t all fully committed to attempting the whole 1,000. For my part, it felt too close to PBP to risk such a big exertion. The possibility of resurrecting my neck injury, or nerve damage to hands or feet seemed all too great, and the prospect of starting PBP not fully recovered just did not seem wise. At 450km though, the first loop out to the West Coast was much more appealing. Almost the exact same distance from Paris to Loudeac and with similar rolling terrain aside from the early climb over Bainskloof: it was a perfect test of whether I could reach my hotel in Loudeac with a big enough time buffer for a 1st short sleep. Our numbers swelled to six in Wellington with Chris van Zyl catching the group after a delayed departure. Open garages or shops were an unknown quantity on the next stretch of road, so we’d decided to stop at the Shell garage at the foot of Bainskloof to top up water bottles before the long overnight stretch. The climb up and over the pass was pitch black in the moonless night, and bitingly cold. But in every other sense it was a beautiful night to be out riding – myriad stars shining brightly in the crisp cloudless skies, and barely a breath of wind. Differing climbing and descending speeds had split us into four groups by the time we reached the valley beyond and joined the main road to Ceres. Somewhere behind were Peter and Nico, and somewhere up front Chris was belting out a lone pace up front. Theunis, myself and Gary stood by the junction for a while – peering into the dark to try and glimpse the guy’s lights coming up behind. Several times we thought we saw dancing LED lights, but each time they proved to be a car or jut a farm light in the distance. After 10 or 15 minutes it was getting too cold to hang around so we opted to push on to Wolseley and wait for the guys there if we could find something open. Thankfully Theunis’ recollection of a possible 24hr garage proved correct and we’d already downed the first round of coffees by the time we saw the guys passing and hailed them inside. It was clear all was not well with Peter though. It’s hard to get the body and legs warmed up in such cold conditions, amplifying cramps, pains and other ill feelings. Under kinder conditions these might normally be ridden through, but Peter was battling and made the difficult decision to retire. With only 80km ridden it must have been a tough decision. Nico made a call home, his father offered to drive out and collect Peter. It was amazingly generous, given it was now sometime around 1am. 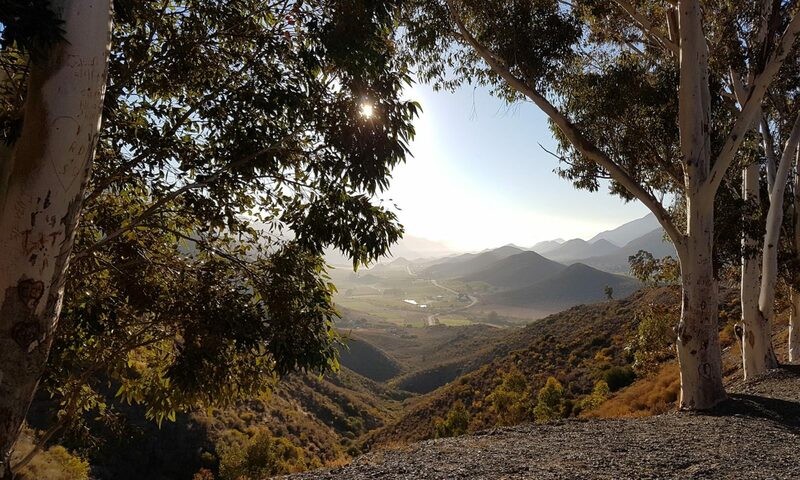 With the impromptu break in Wolesley, we made the decision to push straight on past Tulbagh a few kilometres down the road rather than stop again. After the small rise over the Nuwekloof pass we raced down and swung right through Gouda. The riding northwards became much more rolling, and the pace picked up considerably. It was still painfully cold though. All of us needed a quick pitstop in Porterville, but with nowhere warm to wait inside we stood shivering outside the only establishment open – a brightly light garage forecourt in the middle of the deserted main street of the town. There was no open shop, and only the slightest hint of warmth radiating from the doorway of the attendant’s cabin. Keen for a proper stop we rolled out again and fairly charged down the final 20km of rolling hills to the 2nd control at Picketberg. The last time I’d ridden this stretch was in the stifling heat of teh Cape Monster, more than 2 years ago. A stark contrast to today’s cold morning air, but just as on that ride the distant town edged closer at a snail’s pass – visible at the top of each rise, but barely seeming to get closer. The early pace had been relatively swift and Chris, who had been off the front since Bainskloof, was just leaving the busy truck stop as our group arrived. He swung around and joined up with us again was we headed inside to try and warm up over a variety of coffees and garage pies. Rolling out of the truck stop we did something totally new for me, and I suspect pretty much every motorist who drives the N7 to or from Namibia and Springbok – we actually went into the town of Piketberg. I’d expected no more than a few houses but the main street was surprisingly long and gave the impression of a well kept and little town, or at least so it appeared under the orange glow of street lights. The time was probably around 6am, here and there signs of life beginning as we rolled through the waking town: a few cars here and there on there way to work; and rather oddly two youngish women riding mountain bikes without helmets, not apparently going anywhere. Our group chirped to them as we passed – I forget exactly what was said, something about a nice night to be out riding or some-such. Just out of the town the route turned right and headed West out to the coast. A short ramp started this leg, the vast quarry dropping away to the group’s left as the road rose up and around the edge of the mountains behind Picketberg. Once over the top the pace picked up again, aided both by the long downhill stretch and by Chris driving the group on. We had been forewarned that this stretch had long sections of Stop-Go roadworks. For the most part they were fine though, only becoming a problem in the final few kilometres before Velddrif when volume of traffic, and especially heavy trucks, picked up as daylight broke over Berg estuary and West Coast flatlands. We crossed this 63km in very quick time – a few times Theunis commenting he was concerned the pace would be too high given the distance left to cover. For most of the stretch I was feeling great, pulling hard and easily. But in the last few kilometres before the control stop, my legs and lungs started to agree with him. 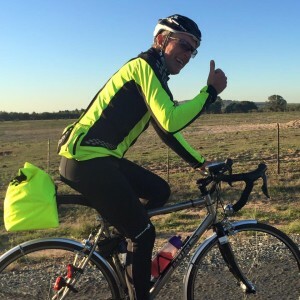 My riding gradually slowed and became more laboured – so much so that Chris and Theunis reached the Engen quite a few minutes ahead of me. 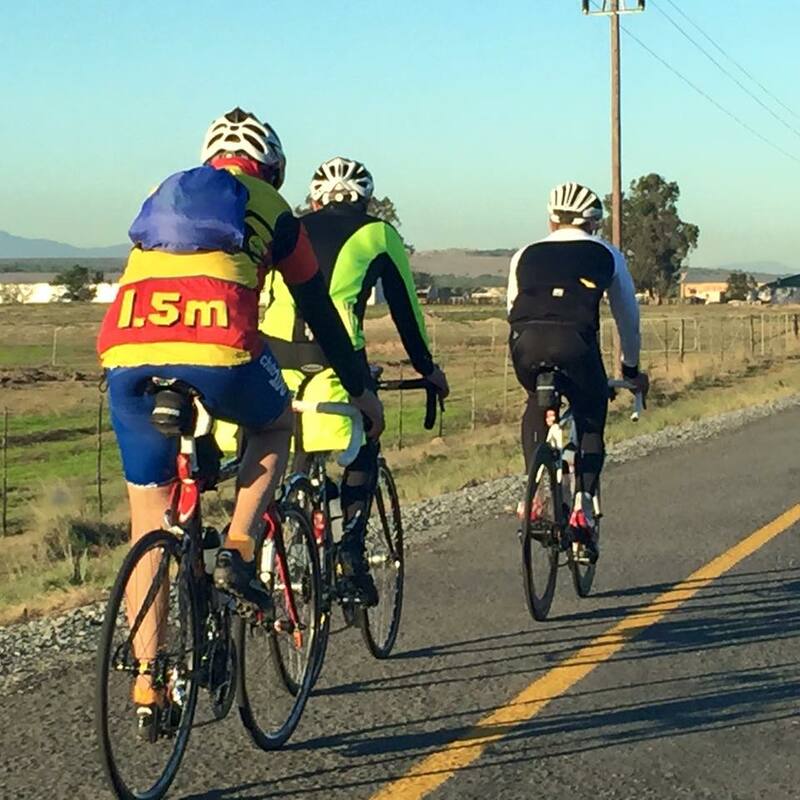 Velddrif (around 220km) saw us gathered again in a garage – scoffing yet more pies and coffee. Only Nico elected to hit the delights of the local OK store. As we headed out again this would be the last we’d see of Nico on the ride. He opted for a 10 minute nap to cure the dozies which were beginning to set in. Once rolling again he broke 2 spokes in his rear wheel as he pushed to catch us up, and became our 2nd DNF of the day. The rest of us stopped briefly at the 3rd official control in Saldanha, before heading for pizzas at a much celebrated and oft visited waterfront restaurant in Langebaan. Those of us visiting for the first time were not disappointed – the pizzas were excellent and the views even better. It was hard to leave, but there was still close on 150km of riding left in the first leg. The next section through the West Coast Park and on to Darling was both delightful, and also almost the only part of the ride which saw us shedding layers and actually warming up in the afternoon sunshine. The stark cold beauty of the night had given way to a glorious winter’s day to be out on the bikes. Sadly Darling saw our 3rd retiree of the day – Theunis’ saddle woes struck again, and his rear was way too painful to continue. The lure of that first 1,000km medal was still strong though as Desiree pulled up to give him a lift home – and the temptation to try and ride on despite the extreme discomfort was visible even as he started to load his bike into the car. Three riders down, three remaining. 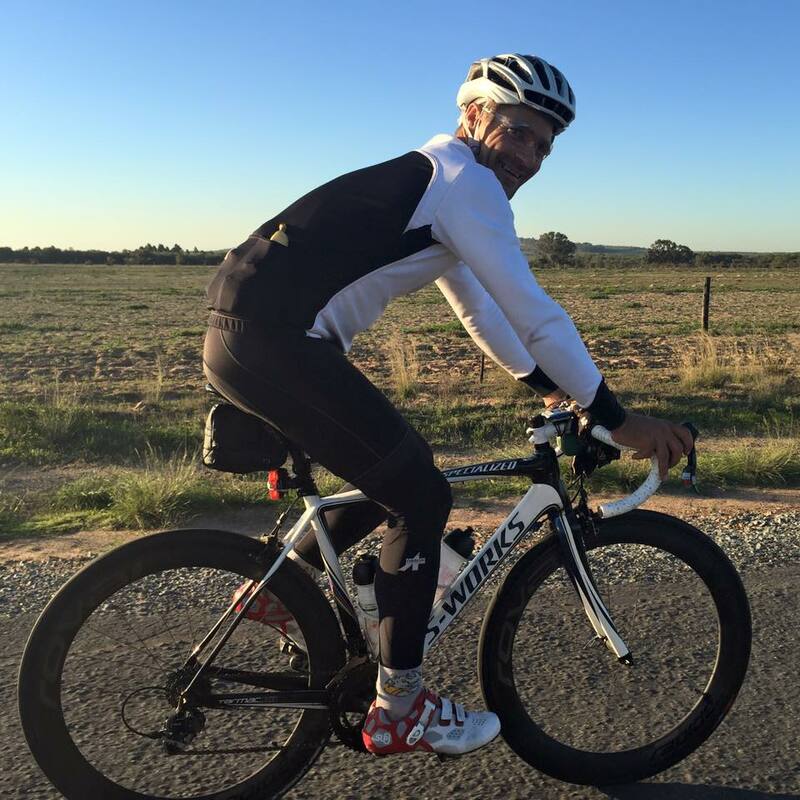 In true champion form, Chris was relaxed and cruising – the pace so much lower than his norm that he commented his legs felt as fresh as on a coffee ride. The same could not be said of Gary and myself – we’d pulled well above our comfort zones the whole day, and the strain was slowly beginning to show over the last rollers into Malmesbury. Unusually, the Engen/Wimpy was not a control on this route, but the temptation to stop for coffees and toasties was too great all the same. It was indescribably hard to resist the temptation to take the short route straight back to Vrede – the official route being some 20km longer via the final control of the first leg in Paarl. As it turned out, it was actually a pleasant alternative to the normal direct route. It was surprisingly fast too, despite being a series of almost continuous rollers. Tired legs and bodies had been refuelled, and spirits were lifted with the home stretch of this leg in sight. Paarl was busy with it being a Friday evening, and riding through the outskirts we passed a serious car accident with blue lights flashing and police cars rushing around. It was a sobering sight, and an unwanted reminder of how fragile and exposed one is on a bicycle with such thoughtless idiots on the road. Once through the long stretch of town, there was just a final 17km or so and two small but unpleasant hills to push over. 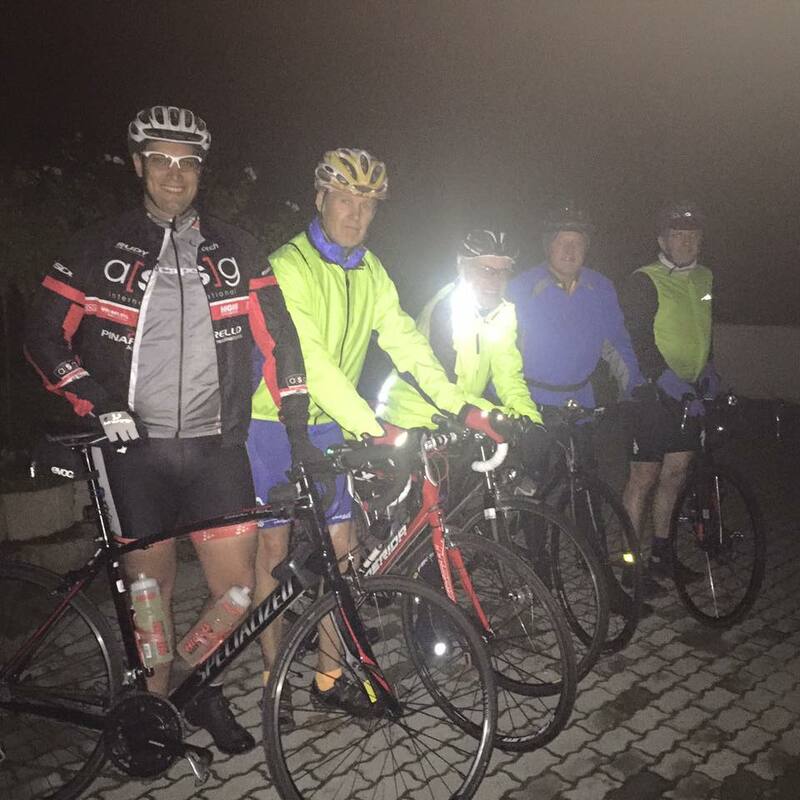 The group rolled back into Vrede at 9:20pm, just over 24hrs after leaving and with 443km in the bank. It had already become chilly again as night fell over the final section, and by the time we pulled into the gate temperatures were plummeting still further. Common sense took over and our remaining group of 3 riders decided to retire and savour the ride already completed rather than head out for a second night of bone chilling riding. For my part, it was an almost perfect last long tide before Paris. The presence of Chris in our group had lifted our pace considerably meaning for much of the day I had ridden well outside my comfort zone. I’d gone through a couple of lows, but much to my surprise I’d never really bonked or broken. Given that our moving average was 2 or 3km/h faster than I usually ride this was a huge and very welcome surprise. Clearly when needed, there is more in my tank than I realise – although it’s also clear I need to be riding in a faster group to give me the confidence to tap into that reserve. Most of all though, our time for the route was almost exactly what I’d been hoping to see. If luck is on my side, and I can get anywhere close to replicating that on PBP, then I should have time for a shower, fuel up, and short sleep stop in Loudeac and be able to leave for Brest with some time in hand over the 2am control close time.